An organic soil amendment is any all-natural material added to a soil to improve its physical properties, such as water retention, permeability, water infiltration, drainage, aeration and structure. The term 'organic' means that it was or is alive. Your soil is comprised of water, air, organic matter, and rock (depending on where you live determines the size of that rock from dust to stones). 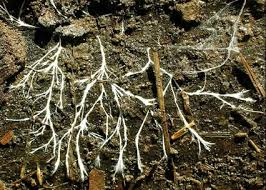 The unseen is what makes your soil healthy - the magic is in the organisms (worms, insects and microbes) that flourish when the other soil elements are in balance. Minerals: About half of your soil consists of small bits of rock that has been broken down by nature and it's biological process. 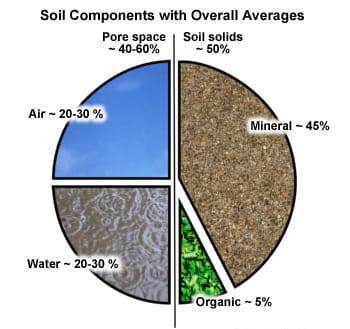 Soil type is classified by the size of these inorganic soil particles with the proportions determining the texture of the soil, which affects drainage and nutrient availability... or how well your plants will grow. Organic Matter: It's the partially decomposed remains of soil organisms and plant life, and your soil should contain up to 10% of it - it's essential. Organic matter binds soil particles together into porous crumbs or granules for water and air to move through it; it retains moisture; and it's able to absorb and store nutrients. The most important factor is that organic matter is food for micro-organisms and other forms of soil life. Soil organisms include bacteria and fungi, protozoa and nematodes, mites, springtails, worms and other tiny creatures; all of them are essential for healthy plant growth. They help convert soil minerals into the vitamins, disease-fighting compounds and nutrients that plants require to grow. Air: A healthy soil contains about 25% air. The air in soil plays an important part as it's a source of atmospheric nitrogen that's used by plants; as well as the insect microbes, worms and soil life require it to live. Water: A healthy soil contains 25% water. Water is held in the pore spaces between soil particles allowing water to move down to the root zone and into the subsoil. In addition to the above, soil is either Acidic or Alkaline which refers to the pH levels with 7 being neutral. Under our Resource tab, there's a chart of the common vegetables, herbs and fruits with their average pH level for optimum growth and production. Need more alkalinity soil? Try these (following recommended usage according to individual amendment directions): ¤ Blood Meal (raises pH) ¤ Wood Ashes (biochar products) ¤ ground limestone - two kinds - preferred is calcitic limestone (calcium carbonate) but if your soil is magnesium deficient use dolomitic limestone (calcium-magnesium carbonate). We carry both types in our retail store. It's fun to learn about your soil and what it needs to be balanced. The easiest way is to test your soil; you can do it yourself with a home kit which will give you a general idea to work from or you can send away to a lab, but be sure the lab checks soils outside of agriculture because they are different tests. (check with your local Cooperative Extension or check our Resources page). It's the best way to know where you're starting and where you need to be for healthy soil. We have an easy to follow general use guideline chart for soil amendments located under our Resource tab. We have all the amendments listed available in our retail store. We found this article - Natural Soil Amendments for Your Garden - in Mother Earth News which gives a good accounting of how to use organic soil amendments. We always advise that the directions are read and followed when applying any type of soil amendment. Basic, Organic Soil Amendments. These are amendments that can be used on their own or with others; some examples: Bat Guano (rich in readily available nitrogen, phosphorus and micronutrients; Bone Meal (source of phosphorus and calcium); Epsom Salt (magnesium); Blood Meal (nitrogen for heavy feeders, ie. corn); Cottonseed Meal (acidic, slow release); and Feather Meal (nitrogen, slow release). Lots more. Blends, Organic Soil Amendments. These are amendments that are blended together to achieve a specific need; some examples: Acid Mix (acid soil loving plants); All Purpose Mix (slow release fertilizer for all plants); Bio Fish (nitrogen and phosphorus, heavy feeders, ie. corn); Bio Turf (slow steady release for the lawn); Pro Organic Mix (professional growing medium formulated for organic growers); and Starter Mix (formula for young starts or transplants). Lots more. Marine Based, Organic Soil Amendments. As the name implies, these amendments have a marine base to them; some examples: Fish Bone Meal (phosphorus and calcium); Fish Meal (nitrogen and phosphorus); Kelp Meal (potash); Oyster Shell (calcium); and Shrimp Meal (nitrogen, phosphorus and calcium). Lots more. Mineral, Organic Soil Amendments. Re-mineralizing heavily used soils is a must, most add minerals as well as trace elements that all plants require; some examples: Asomite (complete nutritional needs, slow-release, volcanic); Cascade Minerals (finely ground volcanic basalt, essential minerals); Glacial Rock Dust (calcium, iron, magnesium, potassium, trace elements, micronutrients); and Pumice (molten material, volcanic, vital minerals, aeration). Lots more. We carry the most extensive availability of organic soil amendments in the Region! Stop by the shop and let us help you find what you specifically need for your situation.